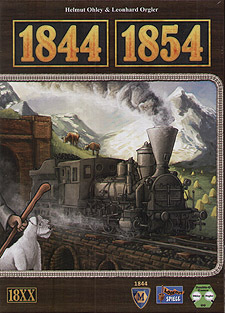 1844 follows the start of public railway operations in the year 1844 in Switzerland. The game incorporates 7 private companies, 5 mountain railroads, 5 tunnel operators, and a total of 15 railroad corporations. 1854 is set inside the current geographical border of Austria. The game incorporates tunnels, a local map in order to build the local network of small companies, and much, much more!